Posted on Sun, Jan 22, 2012 : 7:07 a.m. The Hamburg Symphony Orchestra comes to Hill Auditorium on Jan. 29. It’s not just visual artists who have been inspired by the vastness, the spirit and the beauty of the American West. For choreographers and composers, too, its landscapes, people, flora and fauna have provided ground for movement and canvas for sound. And, to paraphrase that old ad for Levy’s Rye Bread, you don’t have to be American to love that landscape. Take, for example, French composer Olivier Messiaen, who, in a commission commemorating America’s bicentennial, composed “Des canyons aux etoiles”—“From the Canyons to the Stars”—a sonic tribute to America’s Big Sky country. It’s a work as vast in scope and as mythic as the land itself: a 100-minute, 12-movement piece for an orchestra that includes instruments of Messiaen’s inventing as well as conventional ones, with heady material for solo piano, horn, glockenspiel and xylorimba. Birdsong pervades it, and Messiaen paints canyons and deserts, mountains and valleys, visions of the heavens and heavenly visions. It’s not easy to come by a live performance of the work, which was premiered in 1974. But Sunday, Jan. 29, the University Musical Society unfurls a performance at Hill Auditorium by the Hamburg Symphony Orchestra, directed by Jeffrey Tate, with Francesco Tristano as piano soloist. 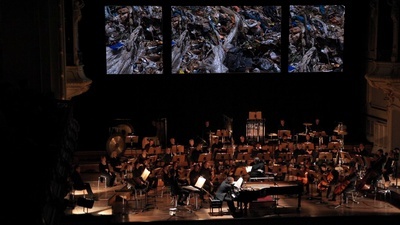 If the piece sits outside the mainstream—a fact acknowledged by its inclusion in the UMS “Renegade” series this season—it does so more in this performance: the music is paired with Israeli filmmaker Daniel Landau’s new cinematic installation, created in response to the Messiaen score. The film images will be projected on multiple screens at Hill Auditorium: surround sound meets surround visuals. Who: Acclaimed orchestra directed by Jeffrey Tate. What: Messaien’s “From the Canyons to the Stars,” with a cinematic installation by Israeli filmmaker Daniel Landau. When: Sunday, Jan. 29, 4 p.m.
How much: $10-$65. Tickets available from the UMS Michigan League Ticket Office, 734-764-2538, and online at ums.org. Filmmaker Landau said he did not set out to create a visual “Canyons to the Stars”. Rather, his contribution, he said in a December phone call from Israel, is to create a counterpoint to Messaien’s vision. If Messaien focuses on sounds of untouched nature, Landau’s modern response is to have us consider, however poetically, images of man’s impact on the environment. Visually, he took he inspiration from the Judean desert and the Dead Sea, focusing his camera on an ecologically fragile region that has, of course, been a cradle of Western religions and civilization, and also of conflict.